Create a separate VMware hard disk (Hard Disk 2) for the appliance. This is the location where you will store your Filr files (files that are located in users’ My Files area). For a clustered Filr deployment, you must create a shared storage location (/vashare) for shared storage among all Filr appliances in the cluster. For a large Filr deployment with only one Filr appliance, it is still recommended that you create a shared storage location, because having a shared storage location allows you to easily scale your system in the future if the need arises by adding additional Filr appliances. For a small Filr deployment, you do not configure shared storage. You can configure Shared storage either on a remote Linux server via NFS or on a remote Windows server via CIFS. For information about how to set up remote NFS for the Filr shared storage location, see Section C.0, Setting Up Remote NFS or Remote CIFS for the Filr Shared Storage Location. An additional NIC should be used only if you have multiple networks associated with the Filr installation; bonding or teaming NICs is not supported with Filr. For example, if your NFS mount is on a separate network from the main Filr appliance, you can configure an additional NIC for the second network. IMPORTANT:When you increase or decrease server memory for the Filr appliance or the search index appliance, you should also modify the Java heap size, as described in Changing the JVM Configuration Settings in the Novell Filr 1.2 Administration Guide. IMPORTANT:Do not power on the appliance until you have created a separate VMware hard disk for the appliance, as described in Step 11. Continue with Section 5.4.2, Installing the Filr Appliance. Download the Filr software (Filr.x86_64-version.xen.tar.gz) to the current directory on the host server. For example: /var/lib/xen/images/Filr1. A filr-version directory is created; it contains a .raw file that you will use to run the virtual image. This process can take a few minutes. Rename the virtual machine by clicking Name of Virtual Machine and specifying a new name in the Name field. Then click Apply. For example, Filr1. Create a separate Xen hard disk (Hard Disk 2) for the appliance. This is the location where you will store your Filr files (files that are located in users’ My Files area). In Hyper-V Manager, right-click the disk name in the Action Pane in the left column of the Hyper-V Manager window. This is the disk where you want to create the new virtual machine. Then click New > Virtual Machine. (Conditional) If your host server is Windows Server 2012 R2, the Specify Generation page is displayed. This page allows specify the generation of the virtual machine. You must select Generation 1, then click Next. IMPORTANT:If you do not select Generation 1 and you select Generation 2 instead, the Filr virtual machine cannot be deployed. In the Startup memory field, specify the amount of memory (in MB) to allocate to the virtual machine. 8 GB (8192 MB) is the recommended minimum for a large deployment of Filr. Novell also recommends 2 CPUs. For an all-in-one (small) deployment, you should increase the default to at least 12 GB (12288 MB) of memory and 4 CPUs. Create a separate Hyper-V hard disk (Hard Disk 2) for the appliance. This is the location where you will store your Filr files (files that are located in users’ My Files area). In Hyper-V Manager, right-click the virtual machine that you just created, then click Settings. IMPORTANT:Do not start the appliance until you have created a separate Hyper-V hard disk for the appliance, as described in Step 16. Root password and confirmation: The root password for your Filr appliance. The root user name is case sensitive and should not be capitalized. When configuring passwords for the vaadmin user for multiple appliances in a large installation, consider using different passwords between appliances for enhanced security. In a clustered environment, Filr appliances are not tolerant to latency, and should exist in the same subnet or near-subnet. If you have not already assigned a second hard disk to the virtual machine (as described in Downloading the Filr Appliance and Configuring the Virtual Environment), power off the virtual machine, modify the virtual machine settings to add a hard disk, then power on the virtual machine. IMPORTANT:Prior to Filr 1.1, you had the option to store Hard Disk 2 (/vastorage) on an NFS mount-point. This option has been removed from Filr 1.1 because of issues discovered with placing /vastorage on NFS storage. You must create a separate VMware, Xen, or Hyper-V hard disk for the data storage location (/vastorage). The third hard disk for /var that you created for this appliance is automatically detected and sdc is displayed as the hard drive. Accept the defaults for the other options on this page, then click Next. If you have not already assigned a third hard disk to the virtual machine (as described in Downloading the Filr Appliance and Configuring the Virtual Environment), power off the virtual machine, modify the virtual machine settings to add a hard disk, then power on the virtual machine. In a large or clustered deployment, select the shared storage location (remote NFS or remote CIFS). This storage (/vashare) is shared storage among all of the Filr appliances in the cluster. There is only one /vashare storage location that is used by all Filr appliances in the cluster. IMPORTANT:You must select a shared storage location in a clustered deployment (if your Filr system contains multiple Filr appliances). It is recommended that you select a shared storage location in a large deployment with only one Filr appliance. This ensures that you can scale your system in the future if the need arises by adding additional Filr appliances. In a small deployment, select Do Not Configure Shared Storage. Remote NFS: Select this option for all large or clustered deployments for which you want to configure shared storage on remote NFS. You must export the remote directory before you choose this option. Also, set the rw and no_root_squash options on the remote directory. You must configure NFS on the remote linux server by setting the rw and no_root_squash options on the remote directory. For detailed information about how to configure NFS, see Section C.1, Setting Up Remote NFS for the Filr Shared Storage Location. Filr does not support using an NSS volume as an exported NFS mount point. Remote NFS is not supported when hosted on a Windows server. Remote CIFS: Select this option for all large or clustered deployments for which you want to configure shared storage on a remote Windows share. If you select this option, skip to Step 12. For detailed information about how to configure CIFS, see Section C.2, Setting Up Remote CIFS for the Filr Shared Storage Location. Do Not Configure Shared Storage: You must choose this option if you are creating a small deployment where all components are part of a single appliance, then skip to Step 13. Do not select this option with a clustered Filr deployment. This option is recommended only for a small deployment, but can be selected for a large (non-clustered) deployment if you do not plan to add Filr appliances in the future. For more information about possible configurations when running Filr in a clustered environment, see Section 3.2.2, Large Deployment. NFS Server Hostname: Specify the host name of the NFS server. This is the remote Linux server or the MySQL appliance that you previously configured for NFS (as described in Section C.0, Setting Up Remote NFS or Remote CIFS for the Filr Shared Storage Location). Windows servers are not supported. When using a remote Linux server for the NFS location (as described in Section C.0, Setting Up Remote NFS or Remote CIFS for the Filr Shared Storage Location), specify the path on the remote NFS server. CIFS Folder: Specify the path to the CIFS share. CIFS User Name: Specify the user name for accessing the CIFS share. CIFS User Password: Specify the password for the user that is accessing the CIFS share. (Conditional) If you are performing a large deployment with multiple Filr appliances, install another Filr appliance as described in this section, until you have installed your desired number of Filr appliances. 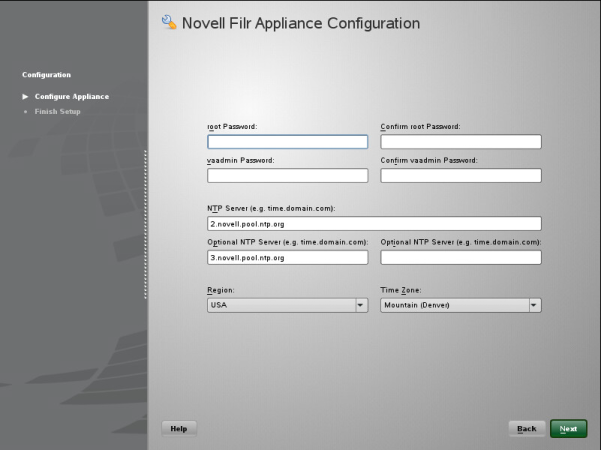 You cannot install multiple Filr appliances in a small deployment. Continue with the first-time configuration, as described in the following section.